The Big Lottery Fund (BIG) has warmly welcomed Sir Adrian Webb as the new Chair of its Wales committee. As Wales Committee Chair he will also sit on the UK Board of the Big Lottery Fund. 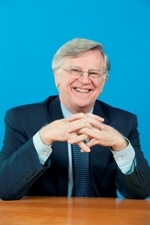 Previously Vice-Chancellor of Glamorgan University, Sir Adrian Webb has a wealth of experience in leading at executive management level in the public, not for profit and education sectors. He has been involved in many UK and Welsh Government initiatives, including chairing the independent review into further education in Wales (the Webb Review) and the Wales Employment and Skills Board. He was also a member of the Beecham Review of Public Services in Wales and part of the HM Treasury Public Service Productivity Panel. In the interview below, Sir Adrian sets out his aspirations for the future. This good news. At last it is being realised just what a difference charity organisations make. I hope this will include the small charities who just need to keep their buildings up to date in order to serve the community! Beryl.